Other precautions in place this year include Santa being asked not to wear his white gloves, so that he can better use hand sanitizer. Many Santas are encouraging children to sanitize their hands before meeting Santa as well. Santa is also having his suit cleaned more frequently than in most years. 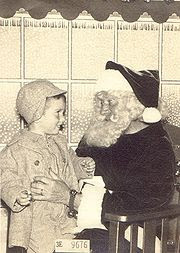 Finally, if parents notice their child is sick, they should not bring him or her to see Santa until they are better. Whether or not your family will be visiting Santa, the holiday season brings an excellent opportunity to ask Congress for a “present:” the ability to earn sick time and access to health care. What will you be asking for this year?